The CD27 antigen is a transmembrane glycoprotein disulfide-linked homodimer composed of 55 kDa monomers. CD27 belongs to the Tumor Necrosis Factor Receptor (TNFR) gene family. 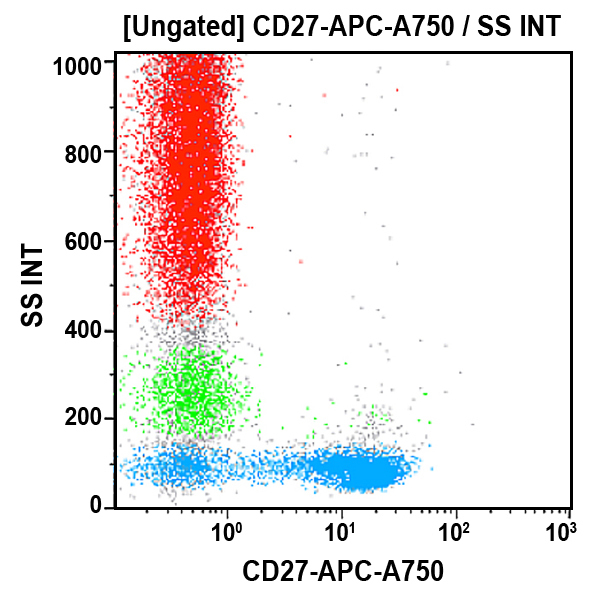 CD27 antigen is found on medullary thymocytes, peripheral T lymphocytes, activated B lymphocytes and NK cells. It is preferentially expressed on the CD45RA+ CD45R0 -, naïve subset of CD4+ T lymphocytes. Its ligand is CD70. *Alexa Fluor and Pacific Blue are registered trademarks of Molecular Probes, Inc.